Y Quad Cities women’s quadruple sculls took the club’s fifth consecutive gold medal at the 2018 USRowing Youth National Championships. Photo: USRowing. Not many crews can say that they’ve won a national championship five times in a row. In Y Quad Cities’ case, its women’s quadruple sculls can do just that. Y Quad Cities dominated the women’s quad final from the start, finishing with over a length of open water ahead of second-place Seattle to secure its fifth consecutive national championship in the event at the 2018 USRowing Youth National Championships, which were held on 8-10 June on Lake Natoma in Gold River, California. Sharis, along with teammate Delaney Evans, also were in the women’s double sculls that secured a gold medal for Y Quad Cities earlier in the morning. Delaney Evans (left) and Carlone Sharis Y Quads Cities took the gold medal in the women’s double sculls. Photo: Y Quads Cities Facebook page. 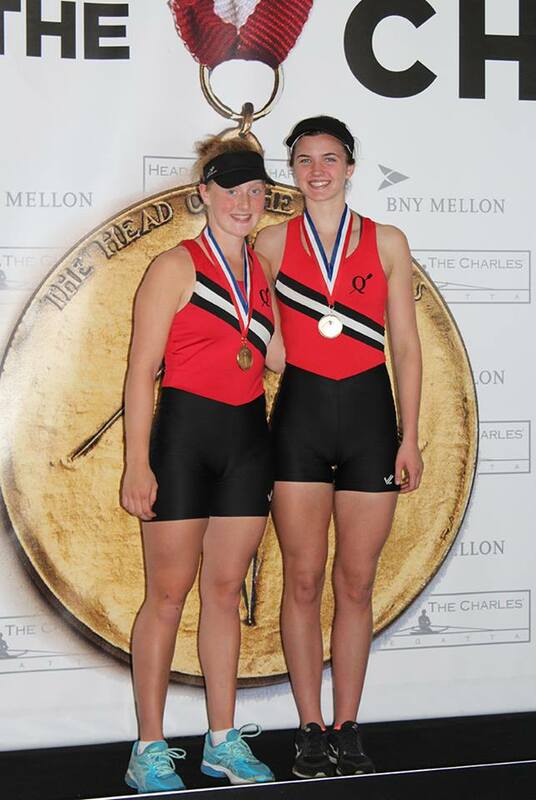 Y Quad Cities also won gold in the women’s lightweight double sculls with a time 7:53.7 over Three Rivers Rowing Association. James Wright of Germantown Friends School has an undeniably impressive youth rowing resume. He won the 2018 World Rowing Indoor Championships, was a member of the Under-19 National Team, and won the SRAA National Championship in the men’s single sculls. Now, he can add a Youth National Championship title to that list. Wright won the men’s single national title by over a length of open water with a time of 7:37.5. 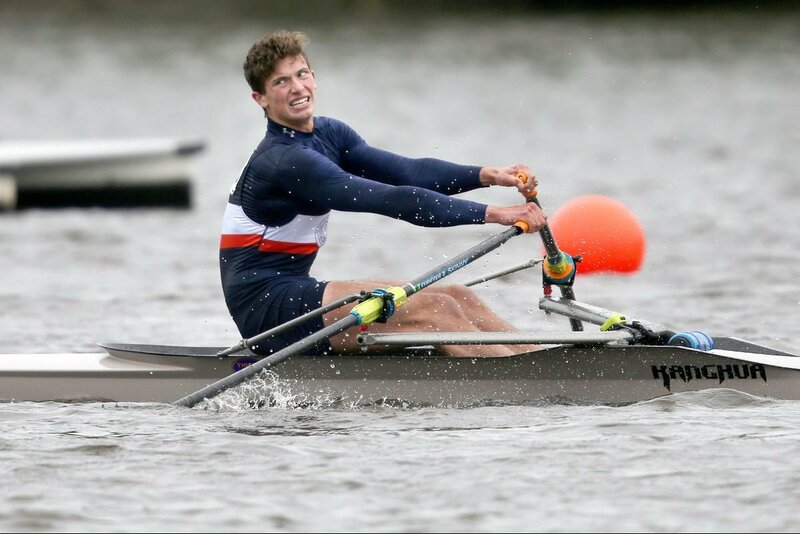 James Wright of Germantown Friends School, USRowing Youth National Champion in the single sculls. Photo: Twitter. This is the first time that Germantown Friends School has won a medal at youth nationals. In other small boat action, Cassandra Reed from West Cambridge won the women’s single sculls by over nine seconds with a time of 8:24.9. Long Beach Juniors pulled away from Texas Rowing Center in the last 250 meters to grab a gold medal in the women’s pair. In the men’s pair, Chicago Rowing Foundation found its groove and took control to secure a gold medal with a time of 7:08.9. With a big push at 500 meters to go, Seattle Rowing Center won the men’s lightweight double sculls over Saratoga Rowing Association by more than three seconds. Saratoga’s John Karen and Michael Fairley were down in the last 750 meters of the men’s double sculls race. With a little bit of courage and guts, they took over in the last 25 strokes of the race to edge out Parati Competitive Rowing and Y Quad Cities for the gold medal. In the men’s and women’s lightweight four with coxswain, Wayland-Weston Rowing Association won the women’s race over Saugatuck Rowing Club with a time of 7:35.6. New Canaan High School Crew had a big charge at 500 meters to go to win the men’s lightweight four by more than six seconds over OKC Riversport. 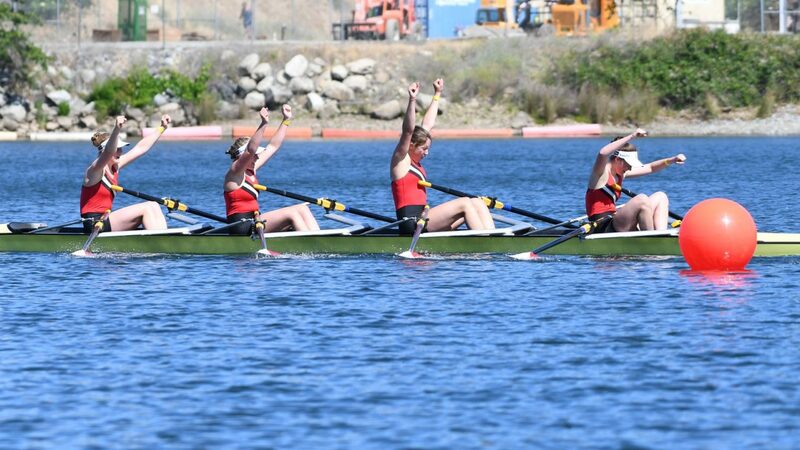 Connecticut Boat Club found success in the women’s youth four with coxswain by winning the gold with a time of 7:29.2. On the men’s side, Deerfield Crew won the men’s four with coxswain by almost three seconds over Belmont Hill thanks to a huge last 20 strokes to secure its national championship trophy. Like its women’s counterparts in the quad, New Canaan continued its streak in the men’s quadruple sculls by winning its fourth consecutive national title. New Canaan finished with a time of 6:25.3 to defeat GMS Rowing Center by more than six seconds. In the women’s eight, Saugatuck continued its legacy by winning the event for a second consecutive year. Saugatuck maintained a half-length lead for most of the race before pulling away in the final 200 meters to defeat Greenwich Crew by four seconds. Greenwich won the women’s lightweight eight with a time of 7:02.8, a full boat length over second-place Oakland Strokes. In the men’s lightweight eight, Oakland Strokes was victorious in the last 250 meters, charging to the line to snag a gold medal and a national championship. To conclude the day, Sarasota Crew’s men’s eight took a huge push at 500 meters to go, pulling away from Oakland Strokes to win the national championship by six seats. For a full list of results, please click here for more information. 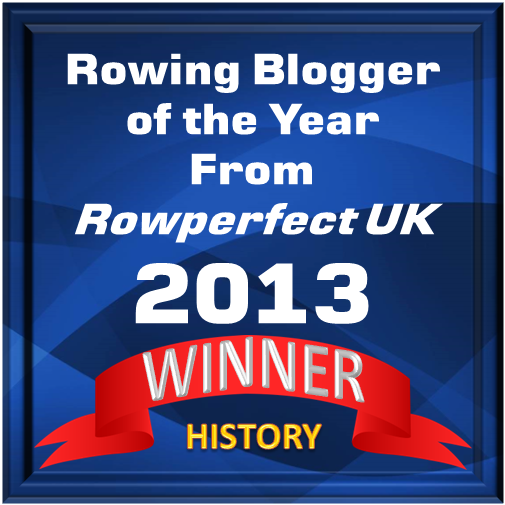 A video recap of racing can be found here. USRowing will be partnering with Visit Sarasota County and the Suncoast Aquatic Nature Center Associates (SANCA) to bring the USRowing Youth National Championships back to Florida for the next three years, the organizations announced on Sunday. 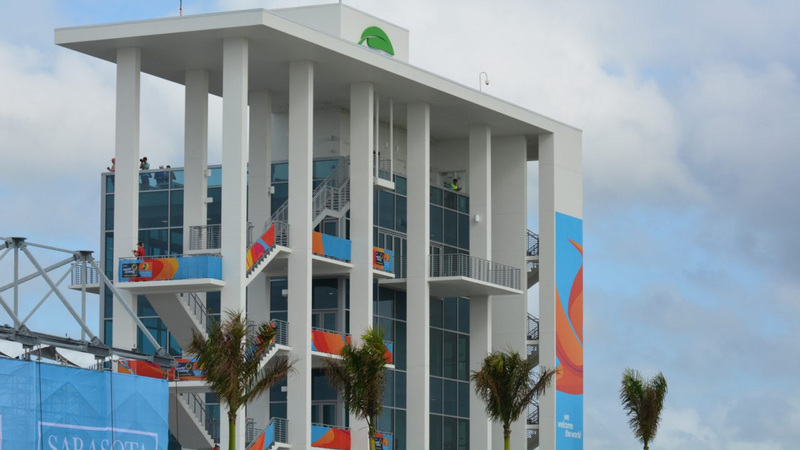 Nathan Benderson Park, which hosted the 2017 World Rowing Championships last September, will play host to the event from 2019 to 2021. USRowing’s goal in seeking a three-year agreement was to provide the best, most consistent racing experience for the athletes and coaches, provide cost stability and savings to re-invest into the event, spur venue and community development around the sport of rowing, and develop greater commercial and sponsorship programs in association with the local organizing committee to support the sport. Dates for the 2019 regatta will be released later this summer.